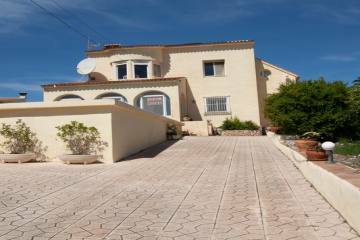 Fantastic South facing renovated Villa for sale located on the Costa Nova in Javea. You are entering the property through imposing gates onto a driveway for several cars. The house has two entrances, one through the covered terrace and the other directly to the kitchen. From the covered terrace (Naya) you enter the open plan living and dining area with a fireplace and a modern recently fitted kitchen. The property has three good sized double bedrooms with a family bathroom and an en-suite for the master bedroom. The property has been renovated to a high standard with double glazing and shutters and new water and central heating system throughout. From the roof terrace, you can see the sea. This property should be viewed.